In many places, specifically where trainers go in to teach journalists and activists how to use various tools on their mobile phone to communicate and share information, the internet connection is often spotty, intermittent or filtered. One of the challenges at these trainings is not having a reliable internet connection, and needing a way to distribute the various mobile apps to the participants. 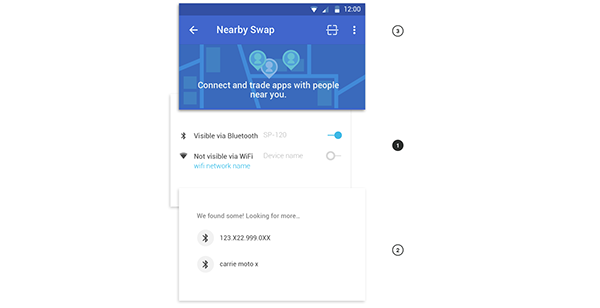 The FDroid Nearby feature started with an aim to help solve the problem of distributing apps in locations where they are either blocked or there's no internet access. So rather than relying on an app store, individuals can literally make certain apps on their phone available to people within the same room. Our goal was to make nearby sharing as easy as possible. When individuals open the Nearby view within FDroid, they are automatically made visible to other FDroid users, and their phone begins to search for other FDroid users nearby. Individuals can either choose someone form the list of people; alternatively, they can connect by scanning someone else’s QR code. In our observations of how individual's share, we noticed that they first either think about the person they want to share with or the actual thing they want to share. To accommodate this second mental model, this design makes it easy to share a single app with someone nearby using bluetooth. Challenge: Offering multiple technical means of connecting people (WiFi, bluetooth, bonjour, QR code, and NFC)* and using familiar UI patterns for users to find others nearby. Our Solution: Automate as much as possible, so that there can be a list of nearby people populating when the view opens. 1) When the nearby view is opened, you are made available to other FDroid users physically near you via bluetooth and WiFi (1). ** Next to the bluetooth and WiFi options, the device name is shown, so that people know who to look for. In user testing, we discovered that individuals rarely know or change their bluetooth device name. 2) The list of people near you, is also populated by devices found on the same WiFi network via bonjour, or with whom you have previously paired via bluetooth. 3) Alternatively, users can scan each other's QR codes from the action bar. 4) NFC sharing is a expert secret that is enabled within the single app view. *To protect users’ privacy the app does not track locations. **To protect privacy, users can opt out of turning them on by default. Challenge: Creating an interface that for two people trading apps as well as one person sharing apps with multiple people. Our Solution: Once individuals have Nearby opened, the process of sharing apps only has to be initiated by one person. Though, if two people are trading, and its initiated by both, it will still work beautifully. The Nearby feature in F-Droid turns your phone or tablet into an app store, enabling you to get and share apps with people that are physically near you.